Roomba 860 vs. 890 (June 2018) — iRobot ROBOT FIGHT! 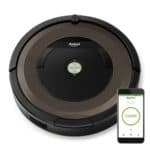 If you like the idea of a robot vacuum that offers a long battery runtime and powerful cleaning performance, you may find yourself trying to decide between the Roomba 860 vs. 890. The Roomba 890 is the newer version of the 860, but is the newer version really worth the increased price? In this week’s comparison, we will be putting both of these Roomba robot vacuums to the test to see which is truly the better option. Roomba is no stranger to the robot vacuum game, especially when it comes to their 800 series vacuums. As the second most advanced series in the iRobot Roomba line, these vacuums are top notch. Each of the Roomba 800 series vacuums is equipped with special features, including scheduling, boundary markers, and HEPA filtration, but there are some other small changes that have occurred with each new iteration in the 800 line. In the table below we’ll take a high-level look at the Roomba 860 vs. 870 vs 877 vs. 880 vs. 890. However, after that, we’ll focus on how the 860 compares to the 890. Roomba’s 800 series offers five different robot vacuum models. They share many similarities, however, there are noteworthy differences that may make one a little better or worse depending on your desires. Diameter 13.9" 13.9" 13.9" 13.9" 13.9"
Height 3.6" 3.6" 3.6" 3.6" 3.6"
Weight 8.4 lbs. 8.4 lbs. 8.4 lbs. 8.4 lbs. 8.4 lbs. The design differences between the Roomba 860 and Roomba 890 are not major, but there are a few things that changed. BUTTONS | The main change made to the 890 was the removal of the schedule buttons that were originally housed on the 860. These buttons allowed users to control the scheduling directly on the unit, but now they must use the iRobot app to set any cleaning schedules. AESTHETIC | Aside from the buttons being removed, the other major change was the color scheme. The 860 embodied a lighter gray and black color scheme. The 890, however, has moved to a copper and black color scheme. SIMILARITIES | Both of these units still contain a dustbin located at the front of the vacuum, a handle on top of the unit, and a bumper ring along the perimeter of the vacuum. The Roomba 860 and 890 actually have identical cleaning methods. This is one of the areas where they don’t necessarily differ much. The cleaning performance of the 890 is better, but we’ll touch on that a little later. PROCESS | Both of these Roomba’s contain two large wheels that help them to roll over debris and work their way from one surface type to another. They also share the method of agitation and sweeping from their brushrolls and spinning brushes. In addition, these models do have a “Full Bin” indicator, which lets the user know when the dust bin is full and needs to be emptied. RELATED – What’s the best robot mop? What accessories come with Roomba 860 & 890? Similar to most robot vacuums, the Roomba 860 and Roomba 890 do not include a lot of extra parts and accessories. These units do not need a ton of extras, as they have everything they need within the unit itself. COMBO BRUSHROLL | This combo brushroll helps to agitate and lift dirt and debris off of your floors. HEPA FILTER | Both of these units include a high-performance HEPA filter pre-loaded into the robot as well as one extra. You will, however, need to buy extra replacement filters over time. LITHIUM-ION BATTERY | Each of these Roomba robot vacuums includes a standard lithium-ion battery that has a run time of up to 60 minutes. When the battery eventually needs to be replaced, you may choose to upgrade it with a 3rd party battery like this one, which can extend the run time dramatically. VIRTUAL WALL BARRIER | The Roomba 860 and 890 also include one individual wall barrier. This barrier draws an invisible line that communicates to the Roomba, stopping it from entering certain areas of a house. SPINNING BRUSHES | Spinning brushes play a large role in the way the Roomba 860 and 890 clean. Two spinning brushes are included with each of these robot vacuums. Only one is used on the unit at a time, meaning you have a spare as well. Replacement brushes aren’t expensive (a few bucks each). The following section is a summary of cleaning performance of the Roomba 860 and 890 robot vacuums, based against a variety of debris, including cereal, kitty kitter, rice, and sugar. Cleaning results for the 860 are estimates based on our 890 tested results. We have not yet completed the 860 cleaning tests. Cleaning results for the 890 are based on our comprehensive testing as part of our full Roomba 890 robot vacuum review. See here full testing data. The Roomba 890 performed virtually flawlessly on the hardwood floor tests. Kitty litter was the only issue we saw during the tests, as rice, cereal, and sugar were all completely cleaned up. Kitty litter hit a level of 99% but was not completely removed from the floor. It only took the Roomba 890 a little over 7 minutes to remove the debris from the floor. This is a per debris type time, but this is also a faster time than almost any other robot vacuum we have tested to date. Bear in mind, we have not tested the Roomba 860, but we would expect similar results based off of the performance we saw from the 890. The hardware on the 860 just isn’t all that different from that 890. Even in a case where hardware is notably different (like in our Roomba 690 review), the cleaning performance is still substantially similar. The low pile carpet cleaning test was slightly different than the hardwoods. Rice, kitty litter, and cereal were all cleaned up to a level of 100%, but sugar was only cleaned up at 65%. The suction power was just not strong enough to completely lift and remove the sugar from the carpet. That said, after running the 890 a second time, it was able to pick up an additional 23%, which brought it to a total of 88% cleaned up. Have pets? See our Best Roomba for Pet Hair guide. The high pile carpet tests were almost the same as the low pile carpet tests. We saw excellent performance when the Roomba faced rice, kitty, litter, and cereal, but the sugar was a struggle. The 890 was only able to remove 50% of the sugar from the high pile carpet. Once again, the thicker pile of the carpet proved to be difficult for the 890 to reach into. Once again, we would expect similar results from the 860, as the design and power of the vacuum are extremely similar to the 890. Is Roomba 860 / 890 Easy to Use? Both the Roomba 860 and Roomba 890 are fairly easy to use. While the 860 does have a few more buttons on the unit itself, the 890 only has three. Both have a power button in the middle of the unit that says “CLEAN.” The 860 has four buttons below that whereas the 890 has two buttons surrounding it. Setting up the iRobot app on the 890 was quite easy. Once you have downloaded the app, it walks you through the setup process and makes connecting the unit to WiFi simple. Both Roomba 860 and 890 are small enough to fit under many furniture pieces. Additionally, both of these units have edge detection sensors, which helps them avoid driving off of stairs, or other ledges in your home. PARTS | Maintenance for the Roomba 860 and Roomba 890 are virtually the same. Probably the biggest difference is going to be the lifespan of the battery. Aside from that, the filter, spinning brush, and front wheel are more than likely going to need to be replaced within the same time frames. BATTERY | The battery on the Roomba 860 is slightly larger than the Roomba 890, however, overall runtime is the same. Nevertheless, we would expect the lifespan of the batteries to be about the same (2-4 years). COSTS | To determine annual maintenance costs, we look at the manufacturer’s recommended maintenance schedule as well as pricing for parts. In some cases, these parts are sourced directly from the manufacturer, but many times there are third party alternates available at a lower price. Based off of everything I have seen, the replacement costs for these two Roomba vacuums are low. We have tested a few other robot vacuums that have had high replacement costs, which can be a bit ridiculous, in my opinion. THIRD PARTY PARTS | Keep in mind, we do search for the lowest cost replacement parts. That being said, we were able to find third-party replacement parts for each of the Roomba 860 and 890 parts. By doing so, the cost to maintain each of these robot vacuums drops dramatically and becomes much more affordable. The Roomba 860 contains a Lithium-ion battery with a run time of up to 60 minutes per cleaning cycle. When comparing to the Roomba 890 this vacuum also uses a Lithium-ion battery with a run time of up to 60 minutes, but it is a bit smaller than the battery used in the 860. The 860’s battery is 2,100 mAh and the 890’s is 1,800 mAh. This most likely means that Roomba 860’s power consumption is a little less efficient than the Roomba 890. Each of these batteries takes 2-3 hours to fully charge. Once the battery is about to run out of juice, each of these vacuums will drive themselves back to their charging base and recharge the battery. With regard to lifespan, based on our experience with other Roomba batteries, we would expect the battery to last 2-4 years (depending on use). Is Roomba 860 / 890 A Good Value? The real question boils down to…which Roomba is better, the 860 or 890? Both of these robot vacuums are strong performers, but there are a few key areas that separate them. These factors may not be of the utmost importance to you, but they are some of the biggest factors that play a role in the decision process when it comes to purchasing a robot vacuum. The filters used in these two Roomba vacuums are the same, the runtime is identical, and cleaning performance is similar. Where the Roomba 890 really pulls ahead is in usability. WiFi connectivity and app control make it much easier to operate the 890 vs. the 860. No need to mess around with buttons. Lastly, price. The Roomba 860 is inexplicably the same price as the 890. So why would anyone ever buy the 860? You wouldn’t. The 890 does everything the 860 does, and more. For these reasons, the Roomba 890 is certainly the better overall value vs. the Roomba 860. MORE – What if you want to save some money? Check out the best cheap robot vacuums. The Roomba 860 is an entry level 800 series iRobot vacuum. Although this is an entry-level vacuum within the 800 series, the 860 is still one of the higher end robot vacuums in the Roomba line. A solid cleaning performance, long-lasting battery, and some extra onboard features help make the 860 a well-rounded unit all in all. RELATED – See our full Roomba reviews page for a breakdown of the most popular Roomba robot vacuums. The Roomba 890 is the top-of-the-line in Roomba’s 800 series. A powerful cleaning performance, sleek design, WiFi capabilities, and more combine to make the 890 one of Roomba’s top vacuums to date. Overall, the 890 offers an excellent value, in my opinion. The addition of WiFi is a major plus, and the design differences help round out the aesthetics of this robot vacuum. While overall cleaning performance is going to be similar to the 860, the 890 is still easier to use due to app control and a better overall value (due to the price being the same). So…Which is Better? Roomba 860 vs. 890? The 890. It’s not really even a contest. The Roomba 890 has everything the 860 has, and more, for the same price. Unless you happen to catch the 860 on sale…you’re better off with the Roomba 890. The Roomba 860 can only be controlled by the physical buttons located on the vacuum itself. On the other hand, the Roomba 890 is able to be controlled by the physical “CLEAN” button, as well as the iRobot Roomba app on a smartphone. This is due to the WiFi connectivity offered by the 890. The price for these two robot vacuums is virtually the same, meaning the 890 is a much better value. Why spend the same amount of money for an older model with less bells and whistles? The Roomba 890 offers more bang for your buck when compared to the 860. Final Decision – Buy the Roomba 860 or 890? Normally in this section, we break down each model into a series of pro and cons, helping to split the finer detail differences. However, in this case, this is such an open and shut comparison that it just felt unnecessary. In the battle of Roomba 860 vs. 890 it’s a simple and absolute victory for the Roomba 890. Has the same runtime, cleaning performance, navigation, accessories, and parts as the Roomba 860. It also has WiFi connectivity (which the 860 doesn’t), which means you can control it via a smartphone, Amazon Alexa, and Google Assistant. It’s also the same price as the 860. In my mind, there is really no reason to go with the Roomba 860. The only exception would be if you happen to find the 860 at a screaming discount. Otherwise, you’re going to be better off with the Roomba 890. For more information on the Roomba 890 see here and for more on the Roomba 860 see here.